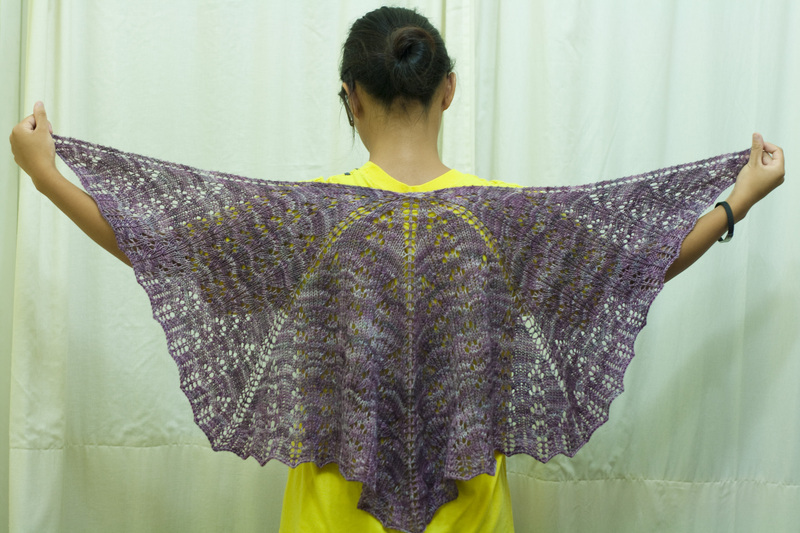 A while ago, dear Amira Lindsay called out for testers of her new shawl design. I’m a sucker for test-knitting even though I have way more WIPs than a local SnB could handle. So yes, I signed up for it. My delivery of the FO is late, but I enjoyed every minute of knitting it. This is what I have left from two skeins of Sundara Sport Merino. I expected to use more for the pattern as written but, as long suspected, Sundara is generous in her yardage estimate for her yarns. 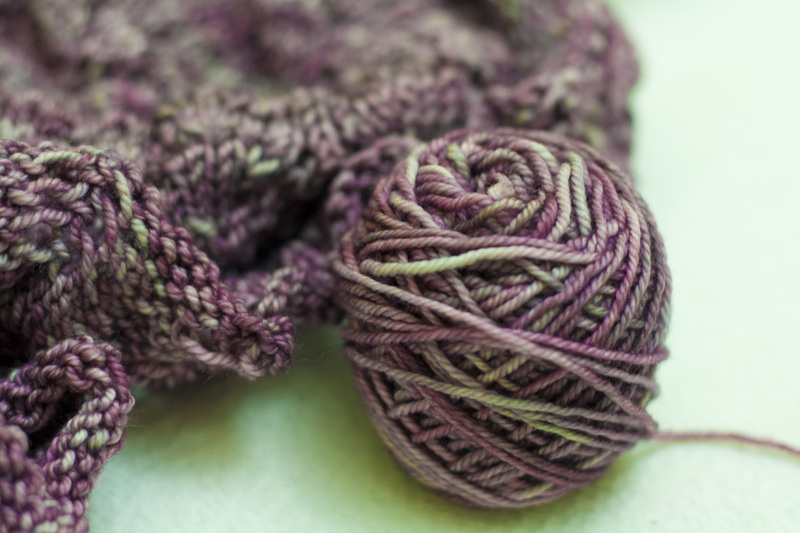 There has to be more than 225 yards per skein of this yarn. 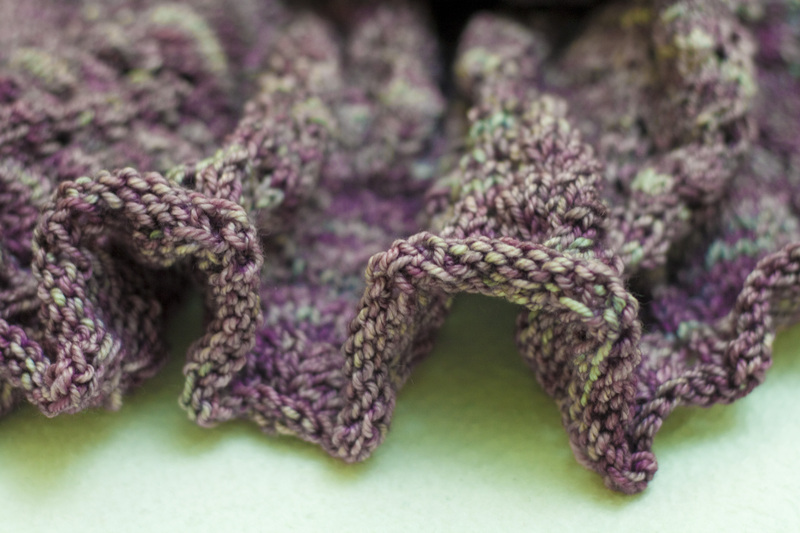 The unblocked shawl is all crumply as can be expected and the ruffled edging is kind of pretty as it was. But of course the lace needed to be opened up so it went into a full bath and stretched out to block. 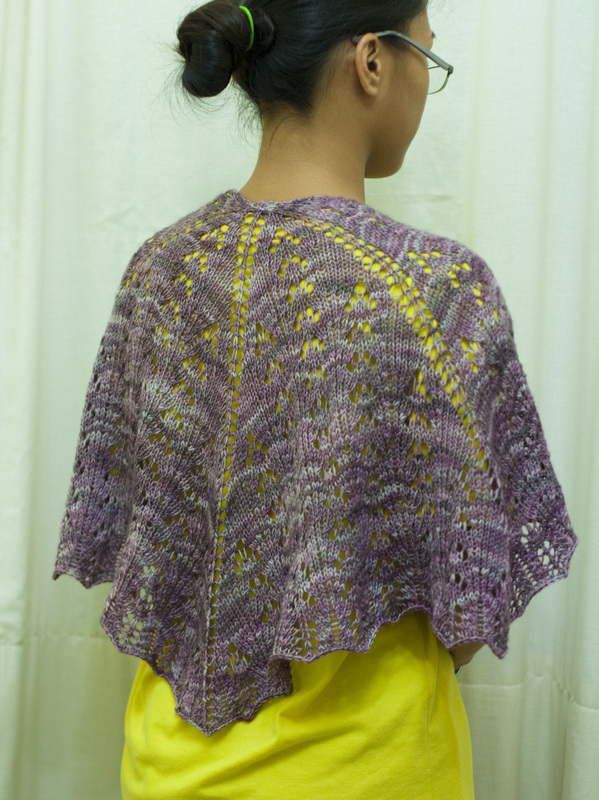 Meet Evelyn, a generous drapey shawl with a gentle lace pattern. It starts with a few stitches but you increase rapidly on every right side row. 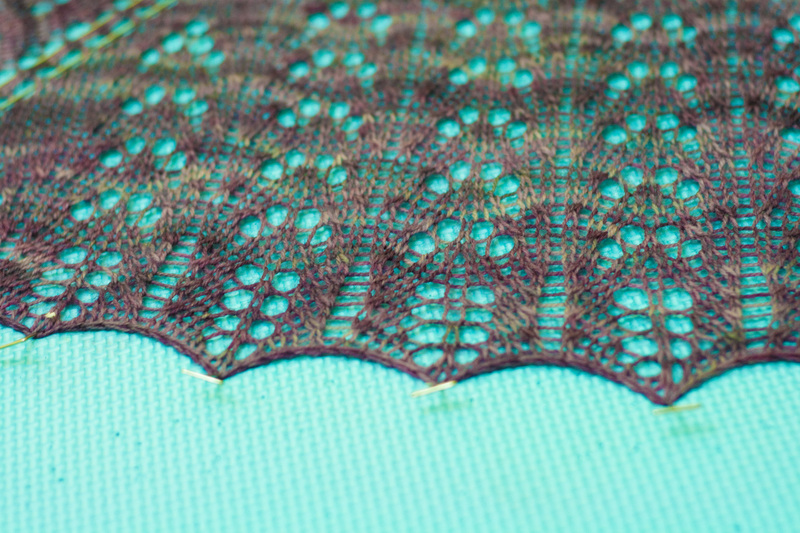 The lace pattern is spread over 18 rows, the body of the shawl is purled on all the wrong side rows. You need a long cable needle for this after your first repeat of the lace pattern as it grows quicker than you think. I love how it drapes over the shoulders and provides good coverage. This will make my shoulders warm at the cinema or the mall. The shawl grew lengthwise as well when I blocked it out. I need to take measurements too as I have no idea what the length and wingspan is. One thing I modified for this shawl is the border. Lindsay’s original border is perfectly alright but my OCD sort of kicked in when I realized the border eyelets do not line up with the eyelets on the previous rows. This is just me so please by all means use the original border on the pattern. It looks pretty much the same as mine. 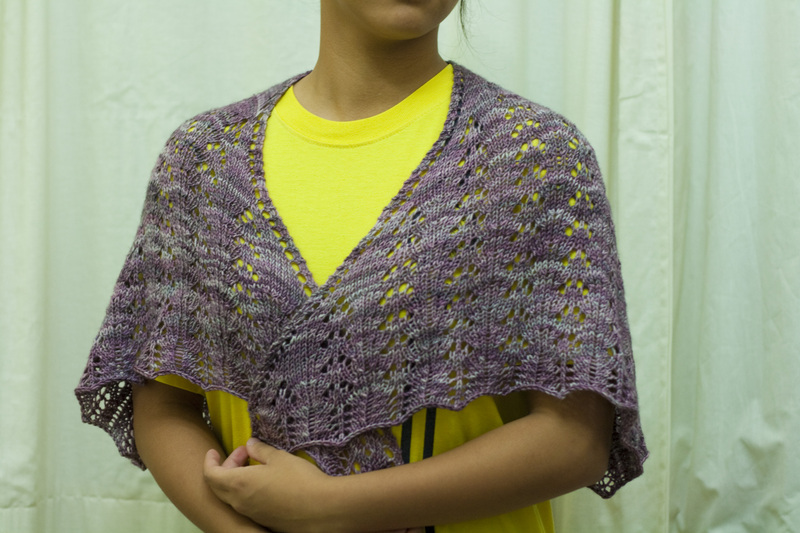 One other thing I love about this shawl is that the shape makes it drape over the front so that you won’t even need a shawl pin to keep it in place. 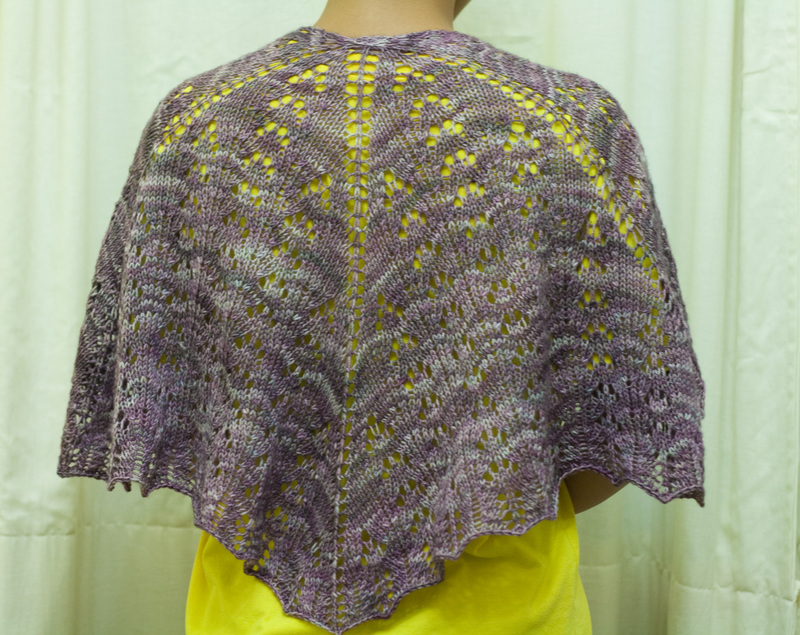 Hala knitted this in a worsted weight and her shawl is massive! I love love the shawl. And I loved working with the yarn. The colour bled a little during soaking but it retained much of the nice muted roses and greys. I have 2 more skeins of this colourway and plan on knitting a vest with it. Should be enough since my unfinished Gathered Pullover took only 2 skeins to finish the body without the sleeves. Notes: Modified the border to make the eyelets line up. This turned out so perfect! I love the shape and the size. Lining up the eyelets add to the symmetry of the design, great work J and Lindsay! !